Arsenal moved to within one point of the Premier League top four and extended their unbeaten run in all competitions to 17 games with victory at Bournemouth. The Gunners took the lead thanks to a spectacular own goal from Cherries midfielder Jefferson Lerma, who volleyed Sead Kolasinac’s cross past Asmir Begovic from 15 yards. Joshua King, making his comeback after four games out with an ankle injury, finished off a swift counter-attacking move to bring the hosts level seconds before half-time. But Pierre-Emerick Aubameyang scored what proved to be the winner after the break when he converted Kolasinac’s cross for his eighth Premier League goal of the season. 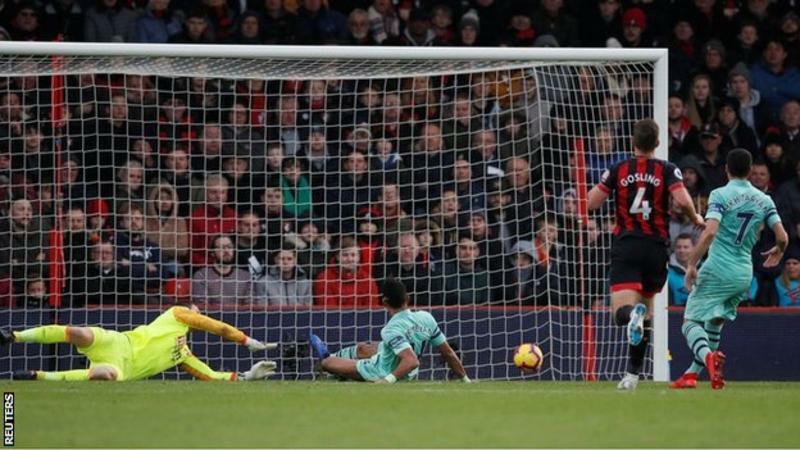 After beginning the weekend in sixth, Bournemouth drop two places to eighth and have now lost their past three league matches. The Cherries were aggrieved early on when David Brooks had a goal ruled out for offside, with replays suggesting he was marginally behind Shkodran Mustafi when the ball was played. But that proved to be the catalyst for a confident display from Arsenal, who secured their fourth Premier League away win of the campaign – equalling their tally for the whole of last season. A run of four draws in their past five games had stemmed some of the excitement generated during the early weeks of manager Unai Emery’s reign. But this impressive performance, against a side who began the day just four points behind the Gunners, will raise hopes among supporters that their side can sustain a top-four challenge this season. With Alexandre Lacazette ruled out with a groin injury, Emery switched formation to a back three, with Aubameyang the lone striker. The Gabon international responded by netting again and moving to the top of the Premier League scoring charts alongside Manchester City striker Sergio Aguero. To further highlight his importance to the side, Aubameyang has now been directly involved in 23 goals in 26 league appearances since joining Arsenal from Borussia Dortmund in January. The 29-year-old was ably supported on this occasion by Alex Iwobi and Henrikh Mkhitaryan, with 14 of the Gunners’ 20 shots at goal coming from those three players. The formation change also allowed Kolasinac to be a constant threat down the Arsenal left, with the Bosnia-Herzegovina international having a hand in both goals. Bournemouth have enjoyed a brilliant season so far but this loss made it three straight defeats – more than they had suffered in the opening 10 games of the campaign. They were second best for much of this match, but manager Eddie Howe can point to two key moments of misfortune. Brooks’ disallowed goal will leave the Cherries rueing the lack of video assistant referee (VAR), which is being introduced in the Premier League from next term, while there is also little a manager can do to legislate for Lerma’s spectacular own goal – his thunderous finish as he stretched to cut out Kolasinac’s pass giving Begovic no chance. Despite those key incidents going against them, Howe’s side demonstrated considerable spirit to level before half-time thanks to a fine finish from the fit-again King. And after falling behind once more in the second half they were unlucky not to equalise when Lerma’s long-range strike hit the post late on. Despite the disappointment, the team have made huge strides this season – they had to wait until the end of December last term to reach their current tally of 20 points. 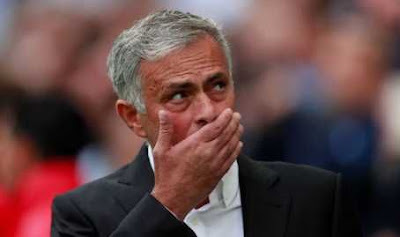 However, with games against Manchester City, Liverpool, Tottenham, Chelsea and Manchester United before the end of the year, Howe faces a real challenge if he is to sustain Bournemouth’s top-six challenge into 2019. Bournemouth manager Eddie Howe: “I thought we were well in the match but there are fine margins between winning and losing and the luck was against us today. Jefferson Lerma’s shot at the end was very close and there were a few goalmouth scrambles where on another day the ball drops our way. Arsenal boss Unai Emery: “We are happy and before the match we knew it would be a difficult match and that we needed to win today to be near the top four. Bournemouth were four points behind us and could have been near our position with a win. “In 90 minutes we deserved to win. We worked with the system sometimes, it’s another possibility and we spoke in the dressing room about how we can be better and control matches. But we have won with another system and we can also do that.